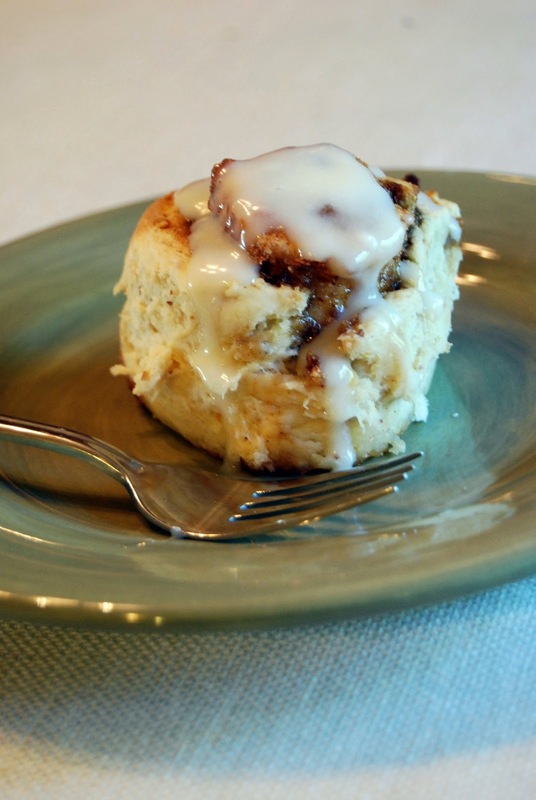 These cinnamon rolls are soooo good and fairly easy to make too! They have a delicious cream cheese icing that is to die for!! The cinnamon rolls don't have yeast, which means you can be enjoying ooey gooey cinnamon rolls several times faster than the old fashioned recipe, and yet they still taste good!! Just like they should! Preheat oven to 425 degrees F. Grease a 9" round pan with butter. Add 1 cup buttermilk, and 2 tablespoons of the melted butter and stir until just combined. Transfer the dough to a floured work surface and knead until smooth - workout some of that stress!! If the mixture is too sticky or wet, no worries! Place in a lightly floured bowl and chill for about 20 minutes. Roll the dough into a rectangle about 12 x 8 inches. Spread 2 tablespoons of the melted butter evenly on the dough. Be sure to use real butter - you are making cinnamon rolls - margarine isn't going to help much with fat/calories, but it will affect the taste! and not in a good way! Combine 3/4 cup packed brown sugar, 1/4 cup ground almonds or hazelnuts, 1/4 cup sugar, 2 teaspoons cinnamon, and 1/8 teaspoon salt in a bowl and spread evenly on the dough, leaving about a 1/2 inch or so border around the edges. Press the filling down gently. Starting on one of the short sides of the dough, roll the dough up, pressing as you go, to create a tightly rolled log. Pinch the seam closed and lay the log seam side down. Cut into 8 even pieces and transfer each roll to the prepared pan. Brush with the remaining 2 tablespoons of melted butter, because it needs more butter of course! Bake in the preheated oven for about 20 minutes or until golden brown. Allow the cinnamon rolls to cool in the pan for about 5-10 minutes, then transfer them to a wire cooling rack. I always place my rack over parchment paper or foil to make for easier clean-up! While the cinnamon rolls are cooling, make the icing by whipping 2.5 ounces cream cheese in the bowl of a stand mixer until creamy. Add 3 tablespoons milk and mix until combined. Add in 1-1.5 cups powdered sugar and mix until desired consistency and taste. Spread over the warm cinnamon rolls and enjoy! We love them. If you make them, let me know what you think! They aren't quite as good as the old fashioned kind, but they are still yummy and a big time saver!! HAHAHA - Linda, you are too funny! Thanks for the LOL. Next time I see you I will definitely be bringing you some! Are you kidding?!!!! These look amazing, I'm going to make them this weekend. Grampy has been asking for these and now he'll get them -- thanks so much for sharing! Thank you so much for visiting and sharing your thoughts! Comments are moderated, so I don't miss anything. I like to read each and every one! I reserve the right to remove comments deemed as inappropriate, threatening, profane, or spammy without notice.